This is a good because there are places of great crime risk in Ecuador as there in in New York, Seattle, Miami, LA or any city anywhere in the world. Yet people in these cities live fine because they know where to go and where not to go. However there are vast parts of Ecuador that have been perfectly safe for us. This is a huge part of our service helping our readers know where readers have ad journeys and where they have not. Merri and I have taken several thousand people to Ecuador without a single violent crime. Where we live, we feel safe being out any time. Children are seen day and night playing, walking…on their own…without fear. I would let my grandchildren go more places in Cotacachi Ecuador than in the suburbia of Rockwood Oregon where I grew up. However everyone has to make their own decision about the realities of risk. 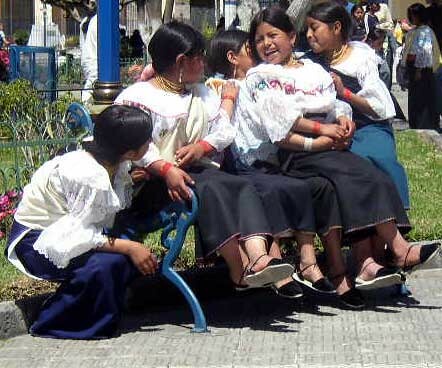 Ecuador people are generally happy like these girls in Cotacachi. Ecuadorians are not violent people by nature. Even the worst reports suggest this. The Overseas Security Advisory Organization wrote in their 2008 rpeort about Ecuador crime entitled “Overall Crime and Safety Situation”. The criminal threat for Quito and Guayaquil is rated “critical” by the U.S. Department of State. Non-violent crime is the most common problem encountered in Ecuador, but police statistics show a significant increase in violent crimes. Reports of murders, rapes, kidnappings, carjackings, armed assaults, and burglaries are becoming more frequent throughout the country. The U.S. Mission to Ecuador personnel and other American citizens are routinely victimized by crime. The Regional Security Officer (RSO) continues to receive numerous incident reports from U.S. Mission personnel and American citizens detailing criminal acts committed against them, their families, and friends. Police reports show that in more and more cases, criminals are using some sort of weapon in the commission of their crime. Children play safely in the streets night and day in Cotacachi. Fortunately in the majority of these cases, the weapon is used for intimidation purposes only, with the result being that cooperative victims are seldom injured. Gratuitous violence is generally rare throughout the country, but is becoming more common in the larger cities, especially in Guayaquil. Public transportation and tourist areas are still the locations with the highest crime rates, although the RSO office receives incident reports from different locations throughout the country. The RSO office recommends that visitors bear in mind that crime can impact anyone, anywhere, at any time, and thus should exercise normal security precautions throughout the country. 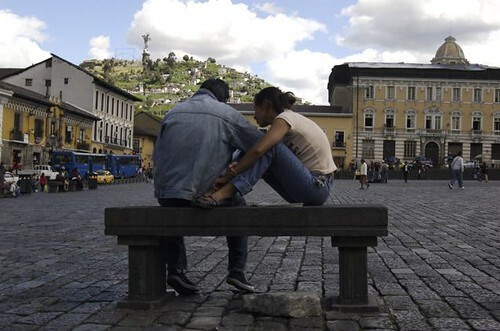 Ecuador is considered a critical crime country and hundreds of Americans are robbed each year. Weapons are readily available and criminals are frequently armed. Ecuadorian people are not violent. I wish I could report that Ecuador is crime free. Even more I wish that the world was crime free. Even more I wish I could report that crime in the USA and around the world was diminishing. This is not the case. Crime is growing in many places. Suburban neighborhoods are becoming refuges for those outpriced in gentrifying inner-cities. Devastated by the subprime mortgage crisis, hundreds of homes have been foreclosed and thousands of residents have been forced to move, leaving in their wake a not-so-pleasant path of empty houses, unkempt lawns, vacant strip malls, graffiti-sprayed desolate sidewalks and even increased crime. Many homeowners not only cut their own grass but also trim the yards of vacant homes on their streets, hoping to deter gangs and criminals from moving in. Other residents discovered that with some of the empty houses, it wasn’t what was growing outside that was the problem. busted several pot homes with vast crops of marijuana growing from floor to ceiling. The white picket fence of an American dream has faded into a seemingly hopeless suburban nightmare. Tomorrow’s message looks at how these shifts in suburbia creates opportunity. The point in today’s message is that crime is everywhere. in Ecuador as well as the US. Ecuador crime has some positive aspects. Ecuador crime typically is not violent. See the worst 50 countries for murder. Mexico is 6th, Costa Rica 19th, The US – 24th, Finland – 30th, Portugal – 33rd, Malaysia – 34th, South Korea – 38th, France – 40th, Australia – 43rd, Canada – 44th, Italy – 47th, Spain – 48th, Germany 49th. Ecuador is not in the top 50. Statistically your odds of being murdered are higher in all the countries above. 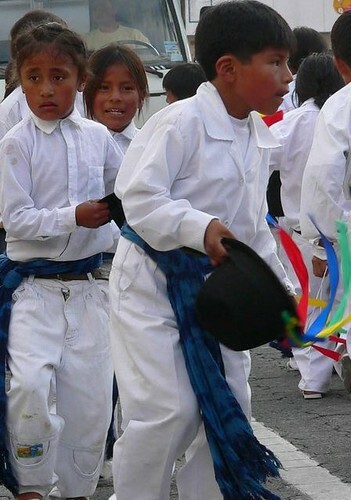 Metals detectors are not required at Ecuador schools. There have been no shopping center shootings! Yet here is the decision everyone must make. Do you want to travel or not? When you visit unfamiliar places you increase your risk of being a crime victim. 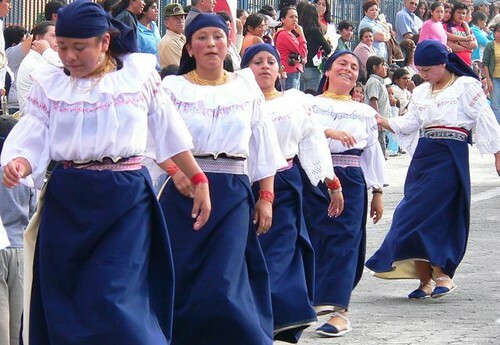 We hope to help you avoid crime in Ecuador by taking you to places full fo color fun and laughter like this parade in Cotatacahi. Join us in Ecuador! See our schedule of 26 courses, tours, mingos and expeditions we’ll conduct in 2009.